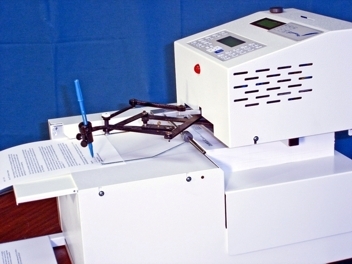 The Signascript Model AF is designed for users with the need for a flexible, 500-page, automatic paper feed system. The standard flash memory SD card stores an almost unlimited number of signatures on each card. The machine has a fast throughput (typically 500 sheets per hour, up to 1,000) and accepts a wide variety of paper sizes and paper stock. The Model AF uses any standard writing instrument such as fountain or ballpoint pens, pencils or felt markers. The machine comes with a dual-barrel pen holder to accommodate oversized pens. As with all of the Signascript systems, the approximate 3" x 5" writing area offers many signing possibilities: a signature, a signature and phrase or message, multiple signatures in one pass for holiday cards and notes, a larger signature for photos and books, and drawings for a special effect. The AF has a password-protected security system, counts usage in three ways (by machine, password and card), and memorizes thirty different setups (combination of passwords and jobs). The unit will easily fit on a desk or table top and operates quietly (an optional stand/cart is available). An optional paper handling unit with paper-reversing capabilities is available for maintaining the sorting direction for customers with mail-merge needs. The Signascript Model AF Plus is an enhanced version of the standard Model AF for high volume users who need documents signed quickly but also need the capability to use standard SD memory cards programmed with spreadsheet data to “handwrite” personalized notes and envelopes in a generic font or in your own handwriting.